Appear in the news feed but not on the front page. Some of these may be old. 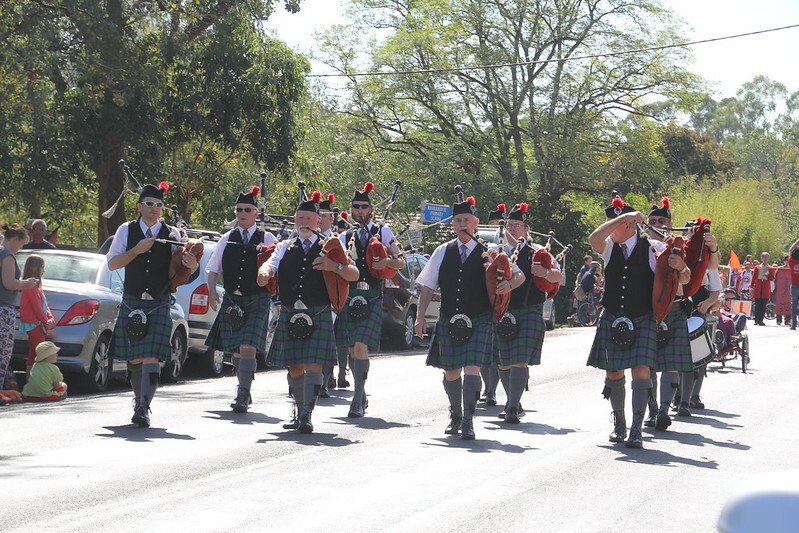 The Ringwood Highland Pipe Band is honoured to again be performing during the annual Ringwood RSL ANZAC Commemoration ceremony on Sunday 14th April 2019. As per previous years the band will meet at Ringwood Square at 0900 to march to the Clock Tower where the commemoration ceremony will be held. Please join us for this solemn ceremony. Band members please be ready with your pipes and drums to tune up at 09:00 am. 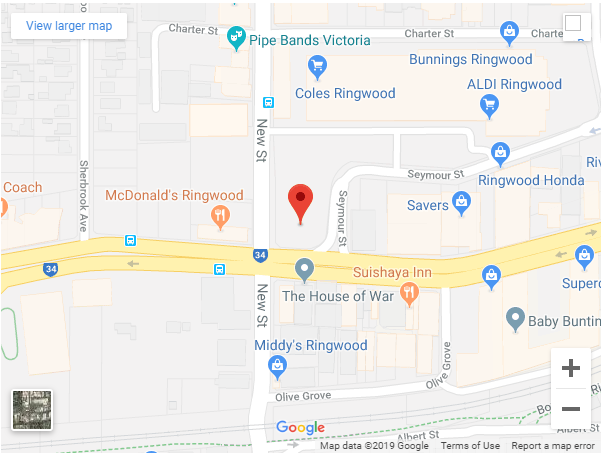 There is ample parking in Ringwood Square (corner of Maroondah Hwy and New Street Ringwood). Some band members will be parking their cars in the Ringwood Railway Station car park just opposite the Ringwood RSL. I will be running a pseudo shuttle service for pipers and drummers, so if you’d like your car to be at the end of the march please look out for me to give you a lift. Also, if you do take up this offer, please look out for band members that may need to walk back to the march start and offer to give them a lift to their cars. Reform at 11:00 am and march to the RSL where refreshments are provided. More information is available from the Ringwood RSL website. This entry was posted in Coming Events, Featured, News, See Us Play on April 9, 2019 by Peter Watson. The Ringwood Highland games is a regular annual event held to celebrate Scottish culture. An outline schedule of the day and an overview of featured events can be found on the Ringwood Highland Games website. The Ringwood Highland Pipe Band is thrilled to continue our involvement in this fantastic event again in 2019 by book-ending the event. We will be leading the Official Party to the main stage to open the games at 9:25 am, and also leading the Parade of Scottish Clans, Dancers, Cadets and Volunteers to the main stage at 4:00 pm ahead of the conclusion of the day. We will also be competing in the Grade 4 Selection of Marches section at 11:20am in Judging area B. Please come along for a fantastic celebration of Scottish heritage and enjoy the sights, sounds and tastes of Scotland. This entry was posted in Community Groups, News, Past Events on March 26, 2019 by Peter Watson. 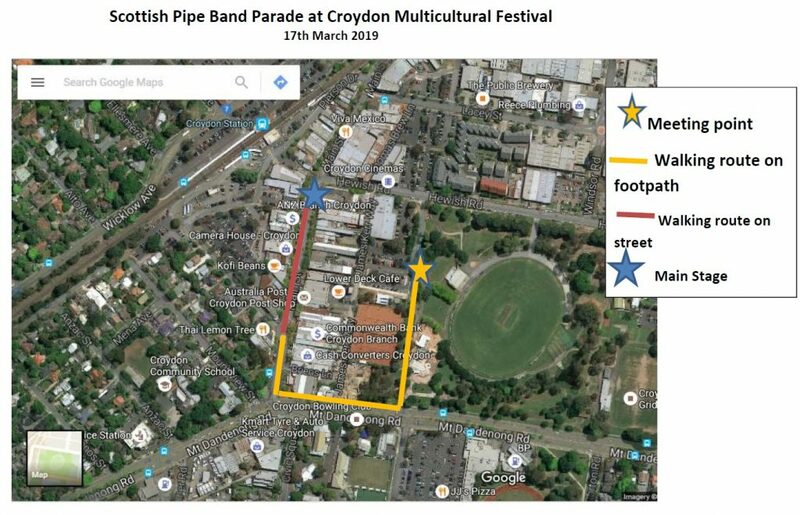 The Ringwood Highland Pipe Band will be marching at the Croydon Multicultural Festival in the morning of Sunday 17th March. Details follow. This entry was posted in Community Groups, News, Past Events on March 1, 2019 by Peter Watson. The Warrandyte Festival is an annual celebration of community, participation and friendship that is held on the banks of the Yarra in March. The Festival is an opportunity for local people, families, schools, community groups and services to come together over a weekend of fun activities. The 2019 Festival will be held from 22 – 24 March 2019. A major part of the festival is the street parade held on Saturday morning where performers and members of the community travel along Yarra Street from central Warrandyte down to Stiggant’s Reserve. The Ringwood Highland Pipe Band is pleased to be a regular participant in the Warrandyte festival and we will again be participating in 2019. All members are cordially invited to a Musical Christmas Dinner. The party will be held at 6:30pm on Wednesday 12 December 2018 at the Ringwood RSL. Guests, family and children are also invited but there will be a small charge for them that will be advised shortly. Colourful Scottish dress is preferred, and please bring your instruments and party tricks! Santa has been requested to come – but his attendance depends on his busy schedule and how many letters he receives! An attendance sheet is available with John Wicks. Please let him know numbers as soon as possible. See you there. You can call him on 9723-9278. This entry was posted in News, Past Events on November 14, 2018 by Peter Watson. The Ringwood Pipe Band along with other Pipe Bands around the world will play the tune ‘Battle’s O’er’ in public places around the world at 5 pm AEDT on 11 November 2018 to commemorate 100 years since the signing of the First World War Armistice. We will join with thousands of pipers and drummers taking part, in shopping centres, on street corners and other places where communities gather. We will play at the Ringwood Clock Tower, please come along and support this important commemoration. Many bands around Australia are taking part, if you click on the following link you can see a map of all the Australian bands participating. Parking. Please arrive between 4:00 pm and 4:15 pm and park at the ringwood RSL. 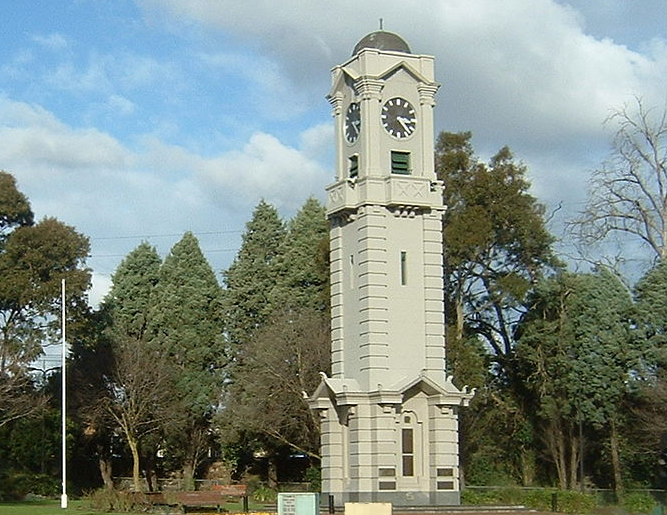 It is a short walk from there to the clock tower. We start play around 4:45 pm culminating in the Battle’s O’er at 5pm. This entry was posted in News, Past Events on November 10, 2018 by Peter Watson. The Ringwood Highland Pipe Band will be appearing at the Maroondah Festival on Sunday 11 November 2018. Event details follow. If you are in the area, come along and enjoy some traditional Scottish highland pipe band tunes. Very limited see below for more info. 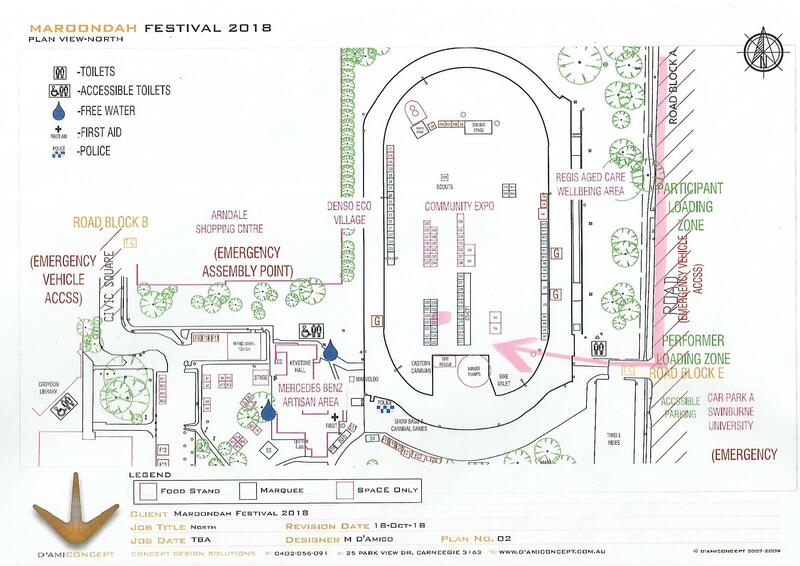 Performance Location: Sounds Stage at the northern end of the athletics track where the community expo is located. Marquee location: C26 and C27 on the map below. Parking. Parking will be a challenge on the day. 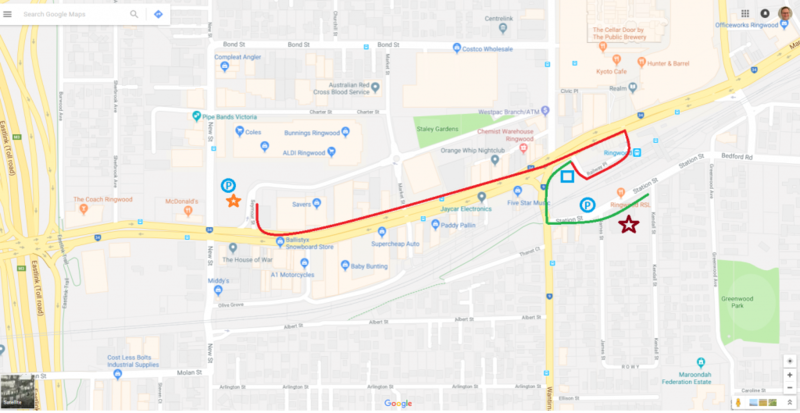 We will have parking permits for a small number of people to park in the Swinburne Uni car park on Norton road. Norton road is closed for general traffic. You will need a pass to enter. For the rest of us, if you get there early enough you will be able to find parking nearby. If you arrive later then you may need to walk a bit. 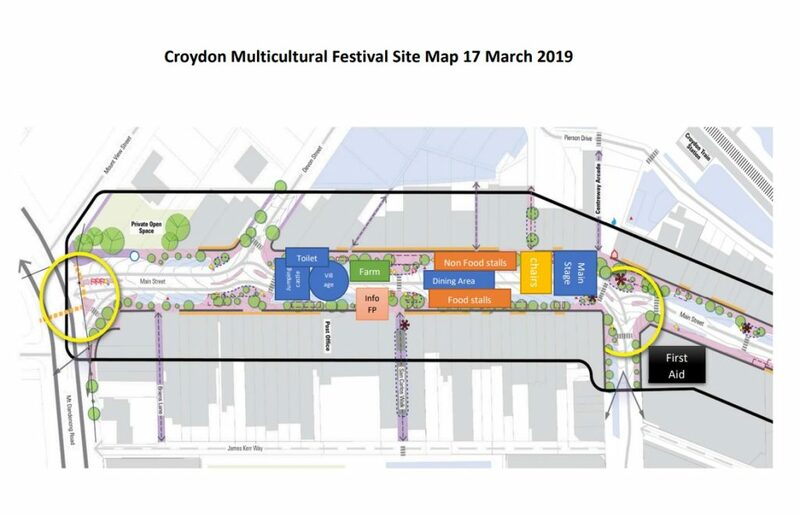 Another option is to park in Eastfield park (Eastfield Road Croydon) and catch one of the shuttle buses to the Festival site. Buses will run every 10-15 minutes or so. Chairs.If you plan on sticking around for some time to man the marquee, please bring a chair to sit on. 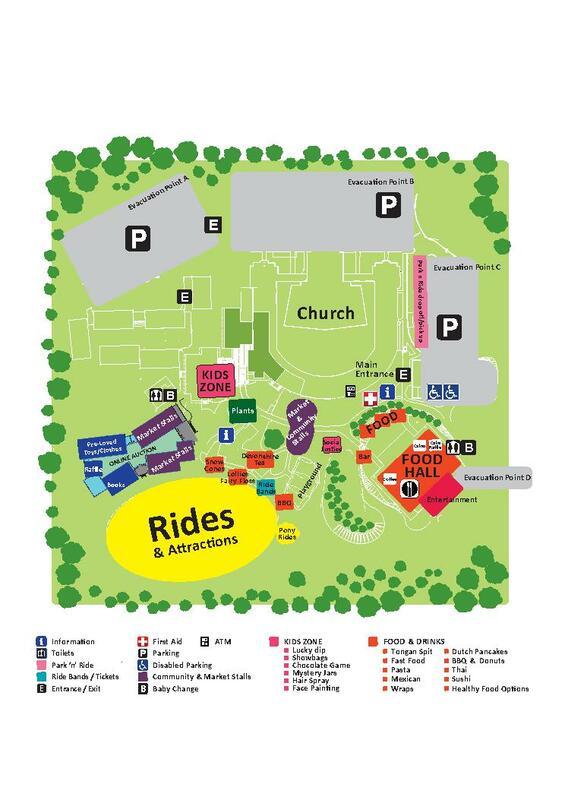 This year we are using festival provided facilities and we are only being supplied 2 chairs. Festival duration. The festival runs from 10am to 4pm. We will need some people on site from 10am. If you can please stick around and help us at the marquee for some of the day. We will be packing up a little early so we can make it to the Remembrance day event in Ringwood. See you all there Sunday! A number of pipers and drummers from the Ringwood Highland Pipe Band will be entertaining the public this coming Saturday at the Sacred Heart Primary School Fete in Croydon Fair. If you are in the area, come along and enjoy some traditional Scottish highland pipe band tunes. 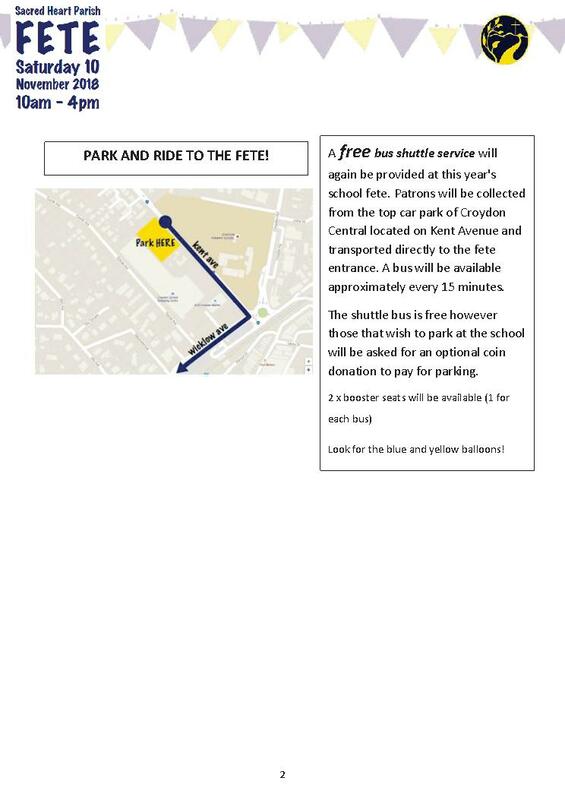 On site parking or on Chevalier Drive. Please see below a map of the location. 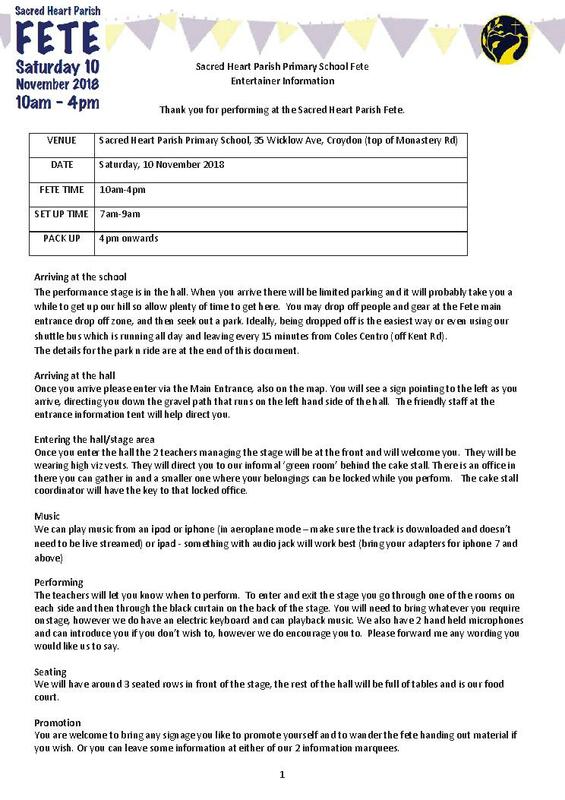 We will meet in the school car park 1:45 pm and 2:00 pm. Thanks to all band members participating. This entry was posted in News, Past Events on November 4, 2018 by Peter Watson. A number of pipers and drummers from the Ringwood Highland Pipe Band will be entertaining the public this coming Saturday at the Great Ryrie Primary School Fete. if you are in the area, come along and enjoy some traditional Scottish highland pipe band tunes. Some parking near school may be available. Please see below a map of the location. We will meet on the oval south of the school between 12:15 pm and 12:30 pm. 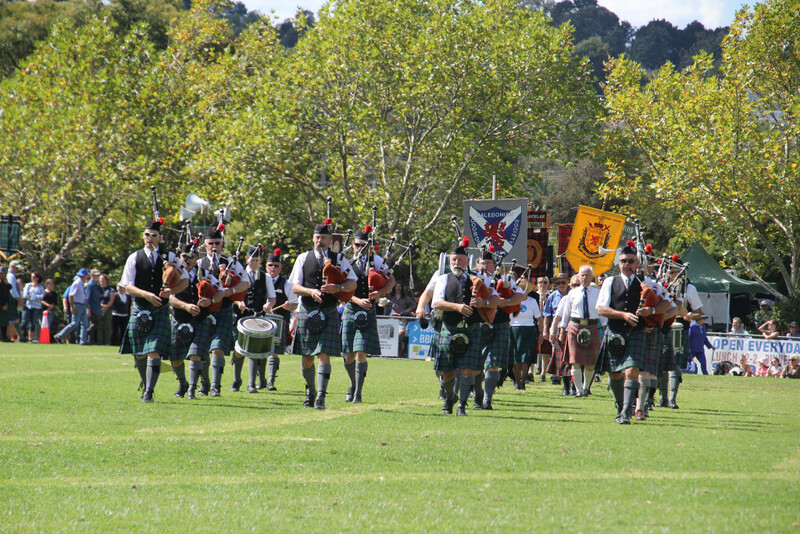 A number of pipers and drummers from the Ringwood Highland Pipe Band will be entertaining the public this coming Saturday at the Ainslie Parklands Primary School Fair. if you are in the area, come along and enjoy some traditional Scottish highland pipe band tunes. Please see below a map of the location. We will meet on the school oval between 11:15 am and 11:30 am. This is a smaller oval alongside the school, not the larger Ainslie park oval. This entry was posted in News, Past Events on October 24, 2018 by Peter Watson.